This post is adapted from an email I sent to staff at my school today encouraging them to support the strike that has been called by the NSW Teachers Federation tomorrow. 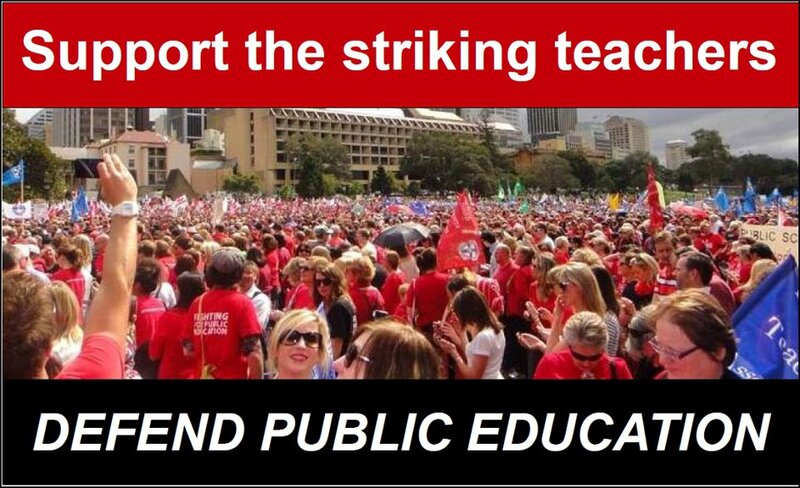 Contrary to anything you may have heard, tomorrow’s industrial action by NSW public school teachers IS going ahead. This is despite an order from the Industrial Relations Commission for the Teachers Federation to call off the strike. In response to this order, the Director-General of the Department of Education, Michele Bruniges, claimed Wednesday’s strike was “illegal”. Of course, that must be determined by a subsequent hearing of the IRC, and the IRC judges have already made it clear they don’t appreciate the government of the day telling them how to do their job. The DG’s email was undoubtedly an attempt to scare some teachers out of taking strike action. But even if the action is later found to be unlawful, no action can be taken against individuals who participate in strike action – only against the union. Teachers (or anyone else for that matter) should not allow anyone to tell us we don’t have a right to strike – it is a fundamental human and democratic right. The fact that the government and the department are running the “illegal” line is proof that they have lost the argument about Local Schools, Local Decisions (LSLD) among the overwhelming majority of the teaching profession. They can’t convince teachers of the merits of devolution so they are trying to stop us taking action against it. As to the issue of lawfulness… On occasion, teachers and other workers feel the need to withdraw our labour to make our point known. For those who are unsure about taking part in joining tomorrow’s strike action, I’d like to point out that any of our working conditions you care to name – pay rises, long service leave, maternity/paternity leave, reduced face-to-face time, reduced class sizes, etc – have ONLY been won by teachers engaging in collective action through our union. I’d also like to emphasise that teachers have beaten these kinds of attacks before, during the Greiner/Metherell “reforms” of the late 1980s. More recently, just last week we saw the firefighters engage in a fantastic strike and rally which saw them force changes to the government’s workers compensation legislation. Collective action works, and I firmly believe we can stop these attacks from the state government. So why has Federation taken such a strong stand against LSLD? 1. The changes the government wants to introduce are underpinned not by educational philosophy but by accounting principles. A team of accountants from PricewaterhouseCoopers has set up in DEC HQ on Bridge St and is driving this process. The blueprint was provided by a secret report commissioned by the previous Labor government, carried out by the Boston Consulting Group. It identified ways to slash up to $1 billion from the education budget. The changes that have already been made to special needs funding come straight from this report. 2. It is top-down and there has been no real opportunity for input from the teaching profession. We are locked out of the process but we are expected to meekly implement it. The process is driven by a steering committee which meets in secret. 3. LSLD is not an educational reform but a cost-saving measure, one that will affect the working conditions of educational staff (not just teachers – support staff as well) and in turn, the learning conditions of students. We know this because this is what has happened in every other jurisdiction where similar measures have been implemented, like in Victoria, where casualisation is rampant and spending per student is 12 per cent less than in NSW. Go back and have a read of the government’s response to the “consultation” [PDF] – there is one oblique reference to evidence from other education systems, but they don’t discuss it beyond that. That’s because there is no evidence that devolution of the kind being proposed leads to better learning outcomes – and the O’Farrell Government knows it. 4. By devolving control of budgets to the school level, the government is abandoning its responsibilty to provide quality education to every student. When things go wrong in future, the school (in particular the principal) will be blamed. That’s why we’re using the phrase “Local Cuts, Local Blame”. It’s already happening in devolved schools in places like WA – have a read [it’s on page 16] of Federation President Maurie Mulheron’s editorial of the current Education journal. Federation has asked the government to sign a Charter of Student Rights [PDF] guaranteeing various aspects of the educational system be kept in place. Until that happens, this campaign will continue. If you’d like to register your support, visit www.localcuts.com.au. For more on the background to this campaign and details of the LSLD/devolution policy, this document [PDF] produced by Federation is a good primer. I urge all teachers and members of the public to support tomorrow’s action, and better still, to join us at the mass meeting in the city! The broadcast begins at 10.30am at Sydney Town Hall.